Overcentre Valve – NG6 | Tucson Hydrocontrols Pvt. Ltd. When used with paired cylinders, overcentre valves assist balancing of the load by transferring part of the load from the heavily loaded cylinder to the less loaded cylinder. 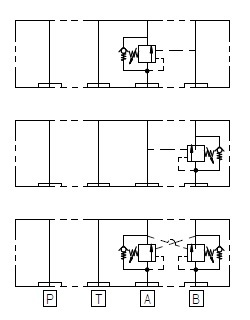 When used with open center DCVs, deceleration control can also be provided. A high pilot ratio improves the efficiency of a hydraulic system, but stability may suffer for overrunning cylinders. The check section allows free flow into the actuator then holds and locks the load against movement. The pilot pressure in the pilot port will give a controlled movement to piston when the pressure is applied. The pressure required to open the valve and allow movement depends on the pilot ratio of the valve. Compact hydraulic system through stack mounting. Improved system response. Eliminates system resonance. Excellent reliability through high strength components. Cartridge design permits service without removing valve from stack.